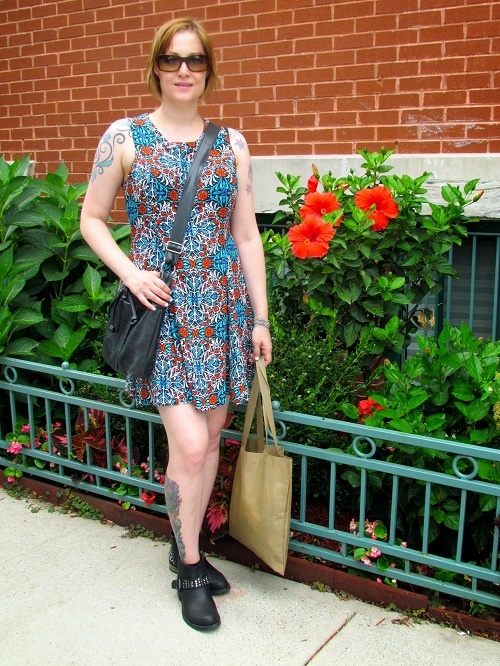 As part of my “pack light; wear dresses” motto, I threw on this cool dress for my excursion to Brooklyn. The boots will look familiar. 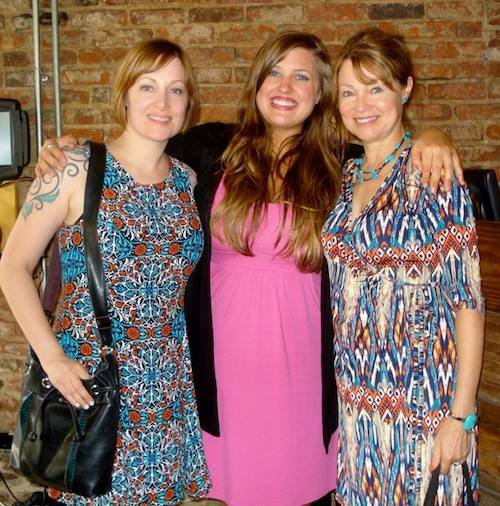 I wore them a lot on the trip (I swear I sometimes wore sandals and ballet flats too) because they were wearable, walkable, and added a funky edge to otherwise sweet dresses. On this occasion, my parents and I visited a Brooklyn flea market (for my mom’s account, click here). We found one indoors as well. We checked out a couple of art galleries too, visited Vaute Couture (my favorite vegan coat store), and ended up at Champs, a vegan diner. 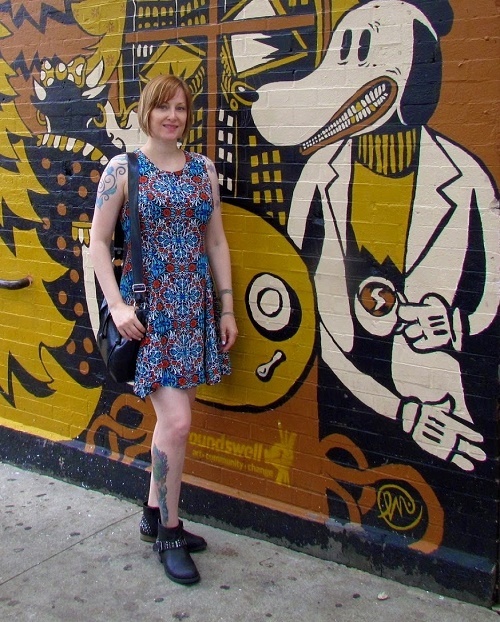 I’ve saved the best part for last: A week later, I wore this dress to New York’s Lower East side for vegan pizza (remember: four dresses–only my parents and you will ever know). Guess who I met at the table next to us? None other than Sarah Simmons. Sarah was on The Voice and is a powerhouse singer. She’s as sweet as she is talented. Truly humble and genuine. She should have a new album coming out soon, so be on the lookout for it. If you missed her on The Voice, check out a couple of snippets of her amazing talent. Her audition blew all the judges away. She does a powerful version of The Story too. Oh, some of you have been commenting (complimenting me on) my new tattoo–the most visible one yet! Thank you. I wrote about it on my other blog, so if you’re interested, have a read. I’m joining Not Dead Yet for a linkup. Have a look at what all the others are wearing! 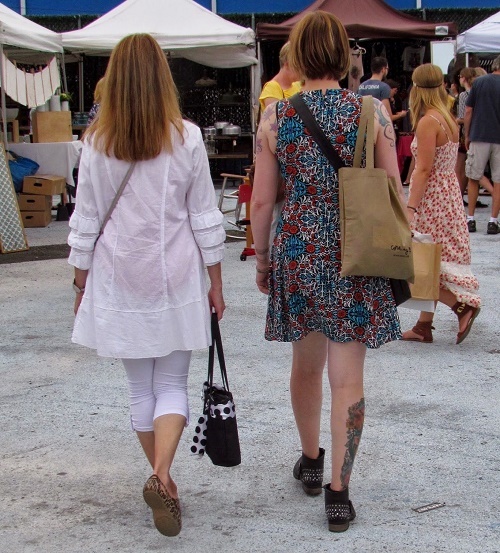 A great post about our Brooklyn adventure and a coincidence that we both blogged about it TODAY! Meeting Sarah was a pleasure, you never know who you’ll run into in NYC! Don’t you love all the great murals in Brooklyn? Your adventure looks like great fun, and I really like your floral frock. Thanks for sharing with Visible Monday! Excellent explorer-wear for the urban adventuress! You two are such a pair of beauties! Thank you! I’m having fun reading my mom’s blog too and comparing notes.